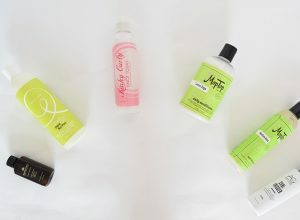 Washing and diffusing curly hair can take up a lot of time, which we oftentimes don’t have – especially in the morning. The alternative to that usually is letting your curls air-dry. This however, leaves me with frizzy hair and almost no volume. This is why I’ve tried another method lately. The past few weeks I’ve washed my curls in the evening right before I went to bed. I’ve done that before, but wasn’t really happy with the results, so I changed a few things about it. Meaning, I wash my curls and then plop, but I don’t diffuse my curls. Instead, I let them dry over night. 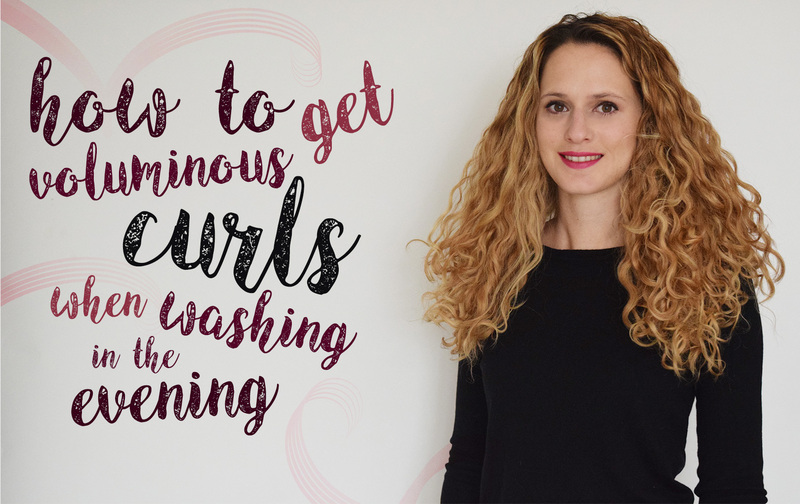 Have you ever tried to wash your curls in the evening? If so, how do you do it? 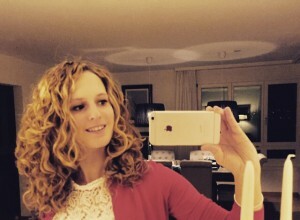 How to best dry curly hair: To blow-dry or to air-dry? I’ve tried going to bed with damp hair before, but never liked my results 😕 But, I’m always willing to try again! I almost always wash my hair at night. I wash and style as usual, but use a little more product that I would if I was washing it the day-of. I plop my hair into a hair towel and let it dry for about 20-30 minutes. I then take it down and add a different kind of gel and put it up in a turban towel to sleep. It usually stays on top of my head all night. In the morning, I take it down, add duckbill clips and let dry naturally the rest of the way. I love using this method. Pineappleing never works for me, so this method has become my tried and true! sounds like a great method, especially since pineappling hasn’t worked for you! Looks amazing and so not frizzy! What is your shampoo/conditioning routine and what products are you using? Hi Sandra! How are you? I am a first timer here to your blog and I have a question for you. Don’t know if you could help me. So basically, have you seen how girls with straight-wavish hair sometimes curl the ends of their hair, so the hair at the top and mid section is straight but at the end it curls (because it was curled with a curling iron)? That’s how my hair is, only naturally. I don’t use any heating products, nor any serum. I just put my hair on my towel and let it air dry. My hair is very long–goes down to my hips. The top remains straight and I can run my fingers through it, until perhaps the 1st top 1/3 of my chest, where it curls into sections, so of course I cannot run my fingers through it anymore without them getting tangled into the curls. I’ve never met a girl with my hair type, nor have I seen anyone on YouTube or any blogs with hair like it, and being the total nonbeauty guru I am, I don’t know how to work it. I can’t crunch it–the curls will get messy that way (pretend they are made with a curling iron, so they are very defined and not scrunched up). I don’t brush it as to avoid breaking it–only brush it after I shower..
Any advice on how I should take care of my hair? Like a step by step process where I don’t scrunch it? Basically, if you were to curl your hair with a curling iron, how would you ensure it would remain with that “freshly curled” vibe for long, considering how using a curling iron is completely different than naturally crunched up curly hair (yours is gorgeous btw). Hi Dani, wow your hair seems to be really long! Yes, I also think that the hairstyles you’re referring aren’t natural but were created with a curling iron. 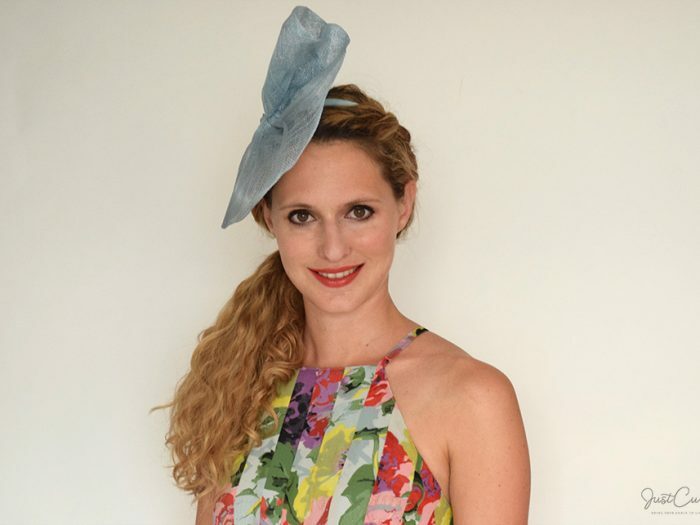 However, the longer my curls get the straighter the become at the top (roots) and the curlier the are at the ends. So therefore it could be that your hair seems to be straight at the top because they are weighed down by you long hair. 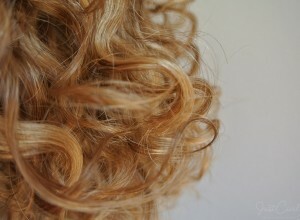 You can just style your curls by applying some styler after washing them, but not scrunch them. However, if you don’t scrunch your hair is most likely going to be straighter. 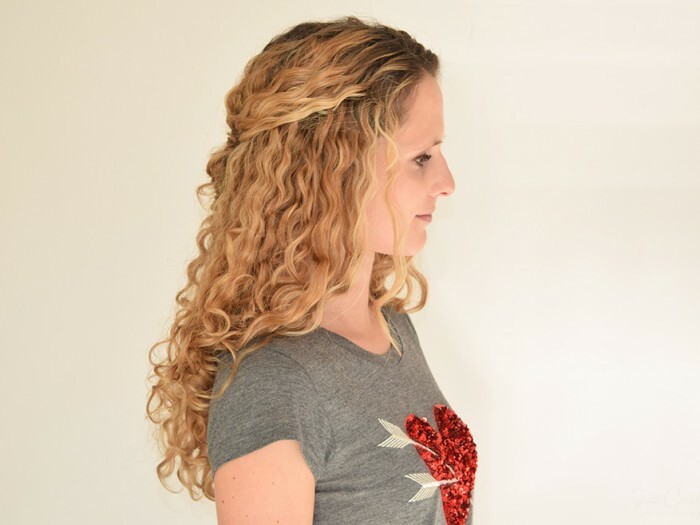 If you’d like your curls to overall be a bit curlier, you could also try to put your curls into two braids (left and right) while letting them air dry. Once your hair is dry, you can unbraid it and you should have more curls at the top (at least this works for me, I’m not sure if it still works with really long hair). Do you have any similar tips for girls with straight hair? I would really love it if my hair would have at least the half volume your hair does. Thanks! Hi Tiffany, unfortunately I don’t know any tips on how to get more volume with straight hair.. I’m not a hairstylist, so I only know the things about curly hair, I’ve learned myself..
Darn, my hair is too short for pine-appling! But it seems to work great for you, your curls look amazing! I absolutely love your site (I’ve been a fan for almost a year now! ), and wanted to ask what changes you notice in your hair when you wash it upside down vs. right side up. Even after much trial and error, I’m still torn about which one helps my curls reach their full potential/creates minimum frizz. My hair is 2C/3A and prone to frizz/curls losing shape in humidity. I have 3B curls (some 3a’s in the mix too) but my hair is also very FINE. I read comments and things about hair taking a long time to dry– mine is dry within 20-30 minutes (shoulder length). If you could give some pointers for those of us with less hair, or link me to older articles, that would be wonderful! I think you could actually also give this method a try! If you struggle with your curls not being voluminous enough, I recommend to use light styling products than won’t weigh down your curls and also to diffuse your hair. 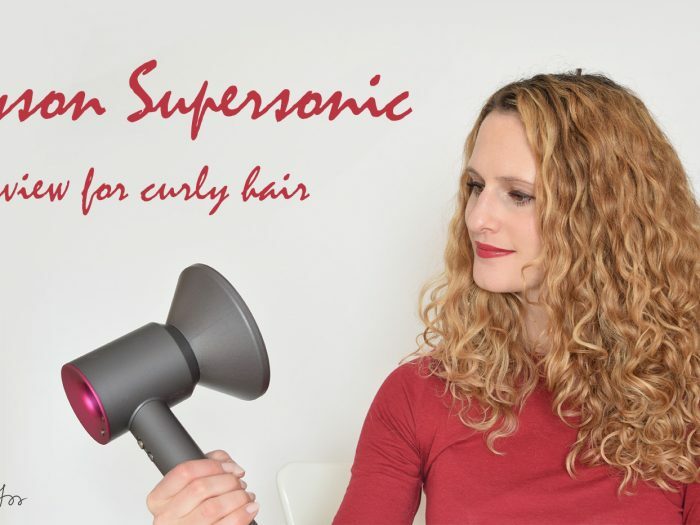 This should help you get more voluminous curls! 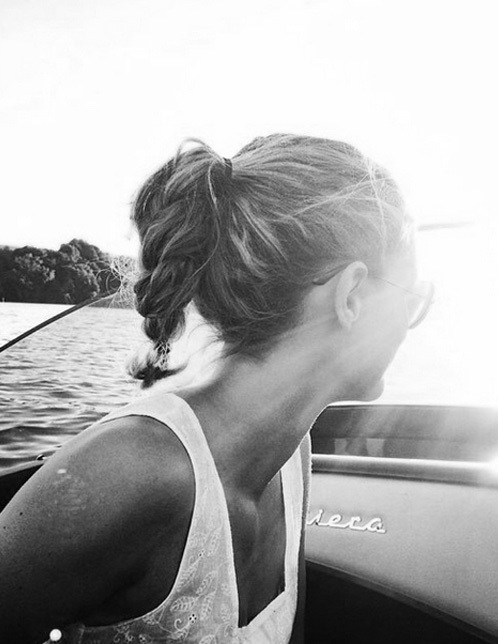 Hi Jen, I don’t know how others feel about that, but it has never been an issue for me, because the hair tie is really close to the scalp.